This recipe is mostly derived from Alton Brown and Good Eats. Primarily the “Steak your Claim”, “Tender is the Loin”, and “Hitting The Sauce” episodes. 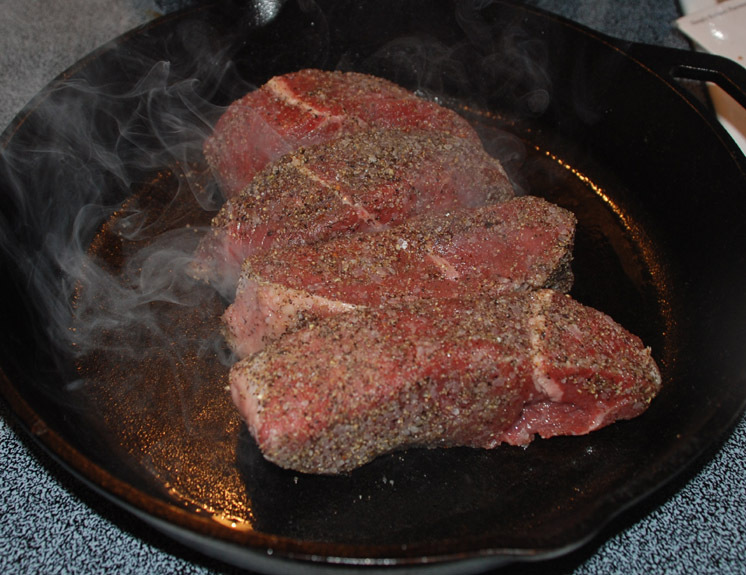 I picked up some cheap red-tag steaks at Food Lion on Monday. Red tags simply mean the sell-by date is a day or two off, and the steak is going to get binned shortly if you don’t buy at the reduced price. Sometimes red-tags are horrid looking pieces of meat, already turning an unappealing brown in the packaging. Sometimes there’s nothing visibly awkward at all. These steaks were nothing amazing, just some square cut (in the cross section, 1″ to a side) strips of low grade beef. 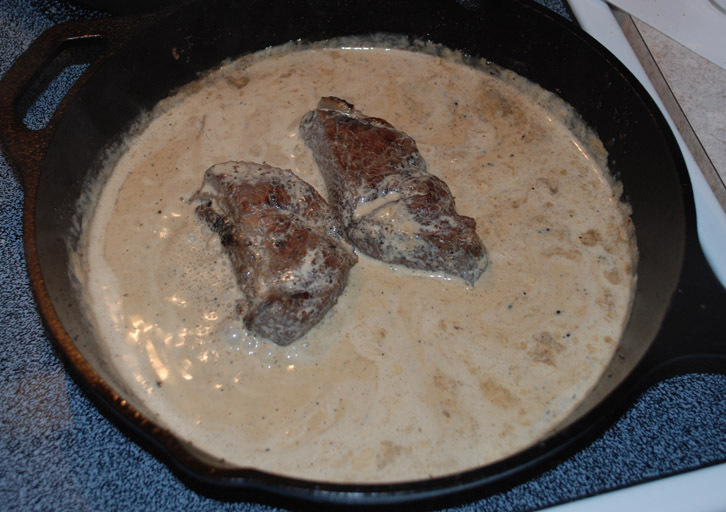 I tend to grab decent steaks like that to be frozen and later cooked in some kind of gravy in the crockpot, as 8 hours of slow stewing in a delicious brown gravy will make even the worst cuts of meat appetizingly tender. Monday, however, I wanted to try searing the outside of the steaks prior to putting them in the crockpot. Searing, as examined on Good Eats, merely adds flavor. 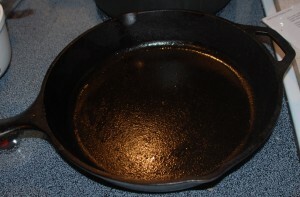 It does not increase moisture retention as some older cookbooks proclaim (in fact the extra cellular damage to the meat increases moisture loss during further cooking). But, seeing as Meabh wasn’t feeling that well, and feeling slightly adventurous, I decided to try going a step further and finishing the steaks myself. Hit the jump to see how I cooked them, and the pan sauce I made afterwards to accompany them. To start with, I took our cast iron frying pan (stainless steel is really better for this, but we don’t have one of those) and rubbed just a bit of canola oil into the cooking surface. I then tossed it onto high heat. I also began pre-heating my oven to 350deg F.
Oh, hey, you notice how I was pre-heating the oven? If you’re using a stainless steel pan, it better be one with a handle thats merely an extension of the pain, in the same manner as my cast iron pan exhibits above. We’re going to be tossing these steaks in the oven to finish them later, and you really don’t want a melty droopy plastic nub where your pan’s handle used to be. Plus the smoke would definitely be unhealthy for you. While the pan was heating up, I took the littlest bit of canola oil ever seen in the world, and rubbed it onto my steaks (which were close to room temperature, but not quite there, which was bad of me. Room temperature helps cook them more quickly/evenly, according to good old Alton. Once I had them oiled up, I dropped them into a metal pie plate with a mixture of kosher salt and ground black pepper. I didn’t have any black whole peppercorns, or I’dve lightly ground those in our mortar and pestle and used them instead. Such is life when you never remember to buy the spices you need. 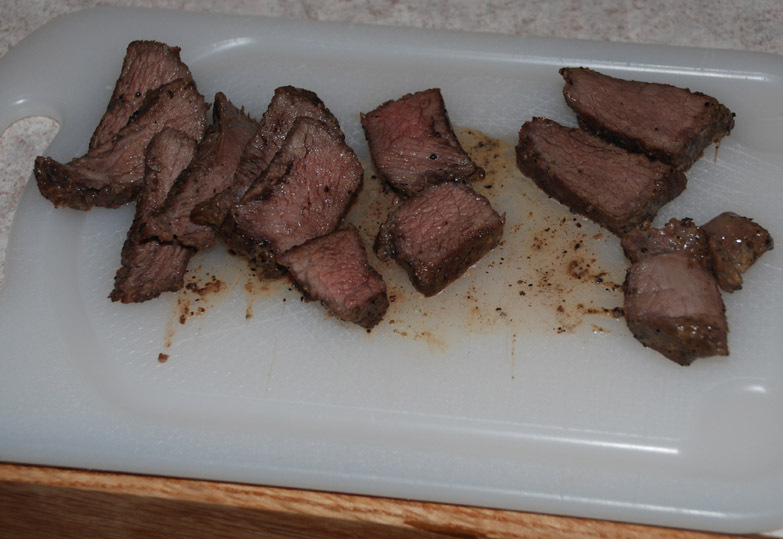 Roll each steak around and get all your sides nice and coated like below. 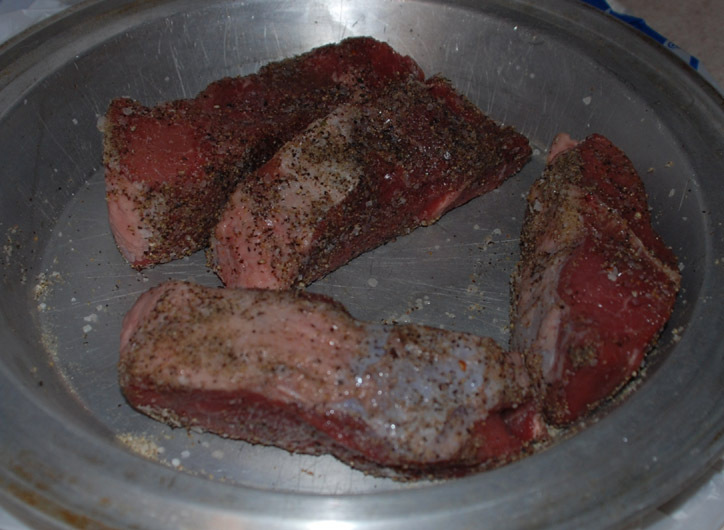 As you can see, I left the thin strip of fat on one side of the steaks in place, to add some extra flavor. It can come off later if you wish, after cooking is done. Once your pan just starts to smoke, toss those puppies in there! About 1 to 1.5minutes on each side, depending how hot your stove gets. You’re going to get some smoke from this, turn your little fan above the stove on. If you have 4 sides to sear like my steaks, I’d turn the heat down a little after the pan is heated up, as the extra time on the heat might produce more smoke than you really want (Let this be the spot where I apologize to Meabh for smoking up the house, even if the smoke smelled delicious). When you’re about done with your last side, kill the heat and open the oven itself. At 350degrees, I left my steaks in for about 15 minutes, until the internal temperature was around 160 degrees F. This was a good medium cooking. Go for 145 degrees if you like medium rare better. 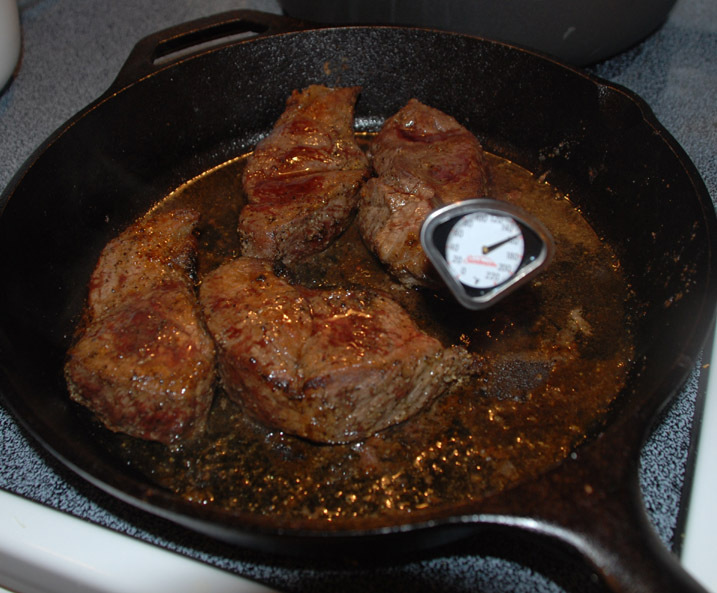 When you open the oven to check the temperature (every 6 or 7 minutes) be sure to rotate the steaks as well. Here, with the focus on the steaks instead of the thermometer, is the finished product fresh out of the oven. Pull the steaks out of the pan and set them aside to rest for a bit. I tossed them in my freshly washed out pie pan. 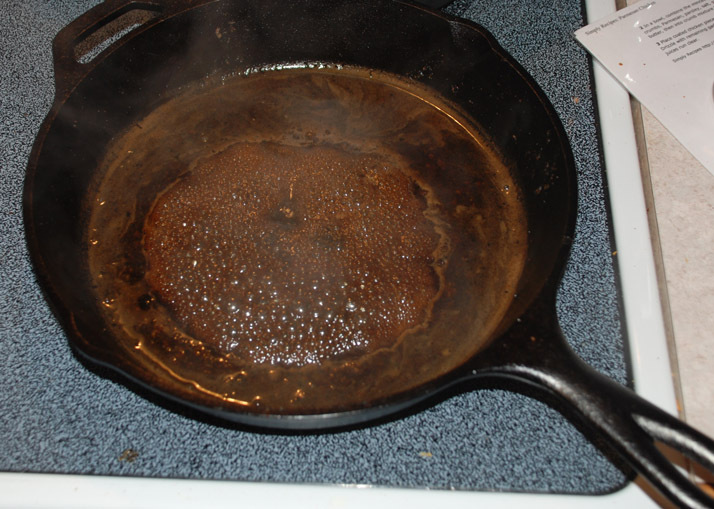 If you’ve got a lot of excess juice and grease in your pan, you might consider draining the majority of it out. Leave the little bits in there though, we need those. Then, turn your stovetop back up to high, and add about 1/2 a cup of either beef broth, or just water and a splash of soy sauce to the pan. Your choice, whatever you have on hand. I used water and soy sauce, myself. Boil this down, scraping the bits of meat residue from the bottom of the pan up with a whisk and stirring it into the mix. Those bits are called the fond, and we’re deglazing them from the bottom of the pan to bend them to our will. Once you’ve reduced most of the liquid out of your pan, things get fun. Turn your heat down to low, and add the remaining sauce ingredients. I used the remaining heavy cream (1/2 pint) from the earlier creamed corn cookery, although again I wish I’d had half and half on hand instead as the sauce would’ve been a bit less rich. I also added 3 tsp of my wife’s whiskey to the pan for a bit of extra kick. Alton uses cognac in his steak’s pan sauces, and green peppercorns and other fancy stuff that I don’t know will ever populate my kitchen. I’m sure you could use various red wines or other liquors as well, if you have one that suites your fancy. Get creative, I did! I added a teensy bit of garlic pepper to the sauce myself to round it out, but the remaining pepper and salt coating from the steak had the sauce seasoned well already for me. Never salt the sauce until everything else is perfect, or it’ll end up too salty. Simmer this mess down on low heat, stirring often with your whisk, until you’ve got a thick creamy sauce. Then, throw some of those newly rested steaks back in there and give them a good coating! You can serve your steaks whole, or cut them into thin slices on a bias (meaning you cut across the grain, it helps produce short grains in the slices so they fall apart in your mouth). Drizzled a bit of this sauce across the steak however you plan to serve. Maybe toss some over mashed potatoes, or over some steamed veggies too. This sauce is rich! and delicious. Oh, and just to show you how the steak turned out, I tried to capture the perfect brown ring of flavorful goodness, surrounding the perfect and uniform light pink interior that resulted from this cooking method. 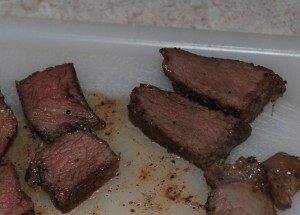 Here’s a cut steak for you to drool over, and a closeup that almost lets you see what I’m talking about. Hope you enjoy this if you try it, and thanks again to Good Eats for the inspiration! A pan sauce wasn’t something I even really knew about before that!